Fiduciary duty is a concept that sounds more complicated than it is. An overly simplified example of fiduciary duty might be: You give your neighbor $200, instructing him to hold it for you until next week. It is your neighbor’s “fiduciary duty” to return that $200 to you when next week rolls around. Your neighbor breaches that fiduciary duty if he instead loses it all in a round of poker over the weekend. A more likely example would be someone who assumes the role of trustee of a loved one’s estate. As trustee, it is your fiduciary duty to manage the assets of that estate responsibly, to pay out appropriate benefits to the designated beneficiaries. It would be a breach of that duty if, instead, you invested all of it in a risky tech start-up. Legally speaking, fiduciary duty refers to the relationship between two parties where one is compelled to act exclusively in the interest of the other. The fiduciary party owes a legal duty to the other party (the principal) and extreme care is to be taken to guarantee no conflict of interest arises between the fiduciary and his principal. In most cases, no profit is supposed to be generated from the relationship without explicit, prior consent. Fiduciary duties can exist in a variety of business relationships. Where a party undertakes to act primarily for the benefit of another, that association turns into a fiduciary relationship. A fiduciary, like a trustee, is subject to a higher degree of duty that obligates the fiduciary to act in a diligent and faithful manner to further the other’s best interests. If you suspect someone has breached their fiduciary duty to you, get legal help as soon as possible. Call the Colorado commercial litigation lawyers right now at 303-792-5595. Fiduciary relationships can take many forms. For example, majority shareholders and directors of a corporation owe fiduciary duties to minority shareholders. Business partners owe a fiduciary duty to the other partners. Banks and investment brokers owe fiduciary duties to their customers and clients. Lawyers owe a fiduciary duty to their clients. Trustee and Beneficiary – A trustee and beneficiary fiduciary relationship emerges most often in estate and trust arrangements. The party named as the trustee is the fiduciary, and the beneficiary is the principal. In this relationship, the fiduciary legally “owns” the estate or trust, maintaining control over the assets. But, the trustee is compelled to exercise decisions over those assets that are in the best interest of the beneficiary. Guardian and Ward – In a guardian-ward relationship, guardianship of a minor is transferred to another party. The appointed guardian, then, becomes the fiduciary and is charged with making sure the minor, the ward, is proved suitable care. This can include decisions related to the minor’s education, health care, and daily well-being. Principal and Agent – In a principal-agent relationship, the agent is legally selected to act for the principal without a conflict of interest. A typical example: a group of shareholders performing as principals when electing management or executives to act as agents. Investors also work as principals when hiring investment managers as agents to manage assets. 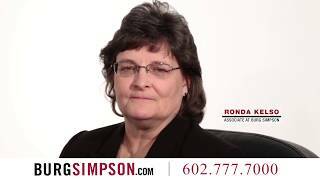 Attorney and Client – The attorney-client fiduciary relationship is a strict one. As the fiduciary, the attorney must act in complete fairness and honesty in all client dealings. If you have been in any of these relationships and you are convinced you have not received the fiduciary duty that you are owed, you need to speak with a Denver corporate litigation lawyer as soon as possible. Did a fiduciary relationship exist at the time of the disputed breach? What was the extent of the relationship and the exact duties of the fiduciary? Finally, which of these duties were breached during the relationship? The breach could be taking action against the client’s best interest, misappropriating funds, or an undisclosed conflict of interest. In short, you must prove that a duty existed, that duty was breached, and that you were damaged as a result of that breach. 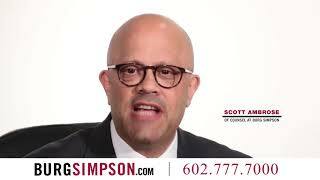 Burg Simpson has extensive experience in handling breaches of fiduciary duty, both from the plaintiff’s and the defense side. We have litigated numerous cases involving a breach of fiduciary duty. If you are engaged in a dispute that could involve a breach of fiduciary duty, we will help counsel you about your rights and legal obligations, as well as represent you in negotiations, settlement, or at trial. 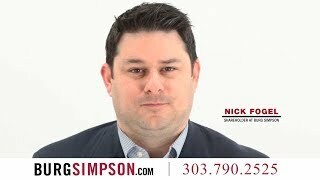 The Colorado corporate litigation attorneys at Burg Simpson can help. Call us immediately at 303-792-5595.